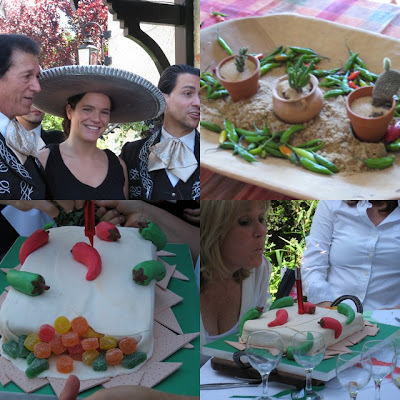 On the day we arrived from Marbella, I received an invitation for a Mexican Fiesta to celebrate the birthday of my sister-in-law at her home. It was a ladies only lunch so my husband and son stayed behind in the city while I went with my mother-in-law and sister-in-law to the residential neighborhood of San Isidro. We arrived just before 1:00 p.m. and were greeted at the door by the birthday girl, Silvia. The front door was draped with a Mexican flag and red, green and white balloons filled the foyer. We went to the garden and were amazed at the wonderful set-up she had prepared. There were five tables set for ten with a centerpiece of mini-cactus and chilis. Each seat had a colorful sombrero and already on the table were terra-cotta containers of guacamole, salsa fresca, jalapeños, mole and chipotle plus baskets of tortilla chips. We were served our Mojito and were seated along with seven other women. Silvia’s daughter, Cecilia, and two of her girlfriends were busy preparing all the Mexican food for the lunch. For starters, there were quesadillas which we ate with the guacamole and the other sauces on the table. Warm black bean nachos followed and were delicious. While we were waiting for the main course, a mariachi band arrived and started to serenade all the women present and even did a special song for the birthday celebrant and for the chef of the day, Cecilia, who was still hard at work in the kitchen. The plat de resistance came after – chicken and beef fajitas, lime-flavored Mexican rice with corn and a mixed salad. The food was excellent and the drinks kept coming which made some of the women tipsy enough to sing along with the mariachis. After the band finished their performance, we were treated to the sparkler-topped lemon-flavored birthday cake covered in white fondant and cheekily decorated with green and red fondant chili peppers. Amazingly enough, the delectable dessert still stuck to the day’s Mexican-theme. 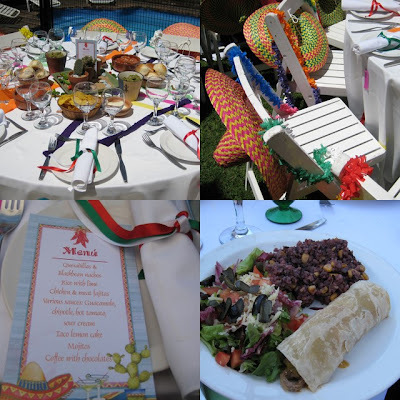 It was a very entertaining and original al fresco lunch which ended after 4:00 p.m. with everyone taking their ssouvenir sombreros and humming mariachi tunes all the way home. Feliz Cumpleaños Silvia!!! Thanks Stockton! I’ve got a few more B.A. posts coming up. Great post! makes me wanna be there- keep em coming!